This questions says that no Softcorp employees attend Handling People. That’s interesting, because normally there are two extra spaces in this game. But for this question, every remaining space has to be filled. 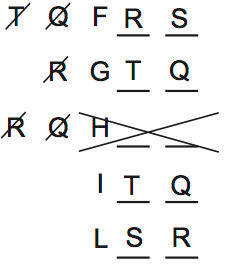 You should think about how to place TQ and RS. They’re the most restricted elements. 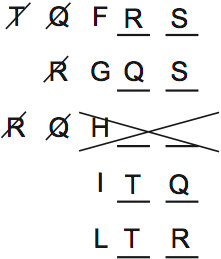 And TQ is the hardest to place, because neither T nor Q can go in Feedback. Every space has to be filled. TQ can’t go in F.
This may seem like a hard deduction. On logic games, you must always think through consequences. If TQ can’t go in a place, then who can go there? 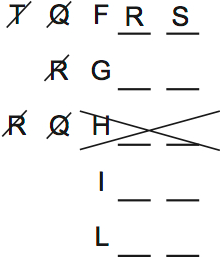 In this case, since only RS are left, we know exactly who must go in F.
This means that A is CORRECT. B is another popular choice. This diagram proves that R doesn’t have to attend leadership. 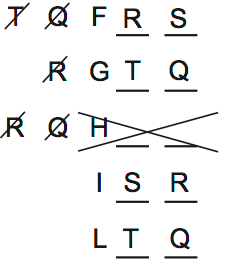 This diagram also eliminates E. Note that the fact that RS go in Feedback is enough to prove A correct. But on review or in case of doubt it’s worth making diagrams to disprove the other answers. The more diagrams you make, the faster you will get at making them. Doesn’t your diagram disproving B violate the third rule that Spivey cannot be with Tran? Yup, that’s what I get for trying to make one diagram do three things. I fixed it, thanks! Thanks for posting these explanations. I noticed that there is a mistake in your last hypothetical for the explanation to question PT 62, Section 3, Question 15. You’ve included S and T together in the Leadership position. Switching Q and T from the Leadership and Information positions fixes the problem and has the same logical force. Thanks, that was an error on my part. I fixed it by making a couple of corrected diagrams. Here’s a biggie… in the text under the can’t-be-B diagram: feedback -> Feedback.